hearth/myth: We have a winner! and: The knitting chair odyssey. We have a winner! and: The knitting chair odyssey. First off this week, congrats to Melissa Bowersock, who won the contest for Sage's birthday last week! Melissa, I'll get the stuff to you shortly. To everybody else, thanks very much for entering. Second, thanks very much to the new Pipe Woman Chronicles fans (at least, I hope they'll be fans once they read the books...) who bought the omnibus at the very special price of 99 cents this weekend. The sale is still on for another few hours, so if you've been meaning to blow a buck on the whole series, or to tell someone else to get a copy, now's the time. And thank you in advance. The chair, complete with my WIP. When the Universe speaks to you, you might as well just pay attention and get it over with. 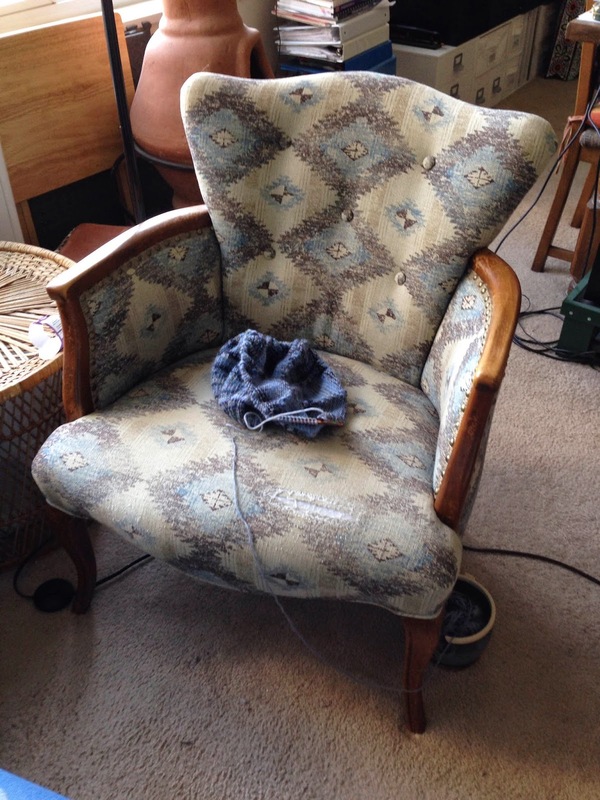 This is my knitting chair. It has a long and storied history with our family, starting in 1998, when I bought it for $10 at a thrift store in Denver, Colorado. It was then upholstered in a gold-and-black chenille fabric -- not my first choice, but the seat was comfortable and the bones were in good shape, and I didn't have the cash at the time to be overly picky. It moved back to DC with us and eventually settled in our basement. (Yes, it's the same basement that Darrell remodels in Crosswind.) The basement was damp, of course, and then it flooded during one bad rainstorm. The upholstery was already wearing out, and now it smelled of mildew. So I looked into getting it reupholstered into something I could stand to have in the living room. First, I thought I'd tackle the job myself. After I read up on it, I decided against it. For one thing, buying the tools would have cost as much as the fabric; for another, pulling the fabric taut apparently requires a fair amount of upper body strength, which I ain't got. So instead, I contracted with a furniture restoration guy to replace the stuffing and re-cover the chair. Something like $800 later, I had a comfy chair that looked great in my Southwest-and-denim living room. (Yes, I blew $800 on a $10 chair from the thrift store. That's how comfy it is.) I put an Ott lamp next to it and it became my knitting chair. I've logged a lot of hours in that chair, on one project or another. The big reupholstering occurred in 2008 -- just six years ago. So I was dismayed last week to notice a big frayed spot on the front edge of the chair. (See it on the right-hand side in the pic?) Not having a spare $800 for another reupholstering job, I covered the seat with a pillow slip and set about looking for a less expensive solution. In other words, a new chair. I started a Pinterest board for my favorites (here it is, if you're interested). One of them is a bonded-leather tub chair that swivels; I was intrigued by the concept, but not sure whether it would be comfy. Plus it was one of the more expensive options, and freight delivery further jacks up the price. I decided to go with the blue wingback, even though it wasn't perfect. So this afternoon, I got in the car and headed for World Market...and drove right past it while daydreaming. Ah, well, I needed to go to Trader Joe's anyway; I figured I'd go there first, and stop at World Market on the way home. So I got what I needed at TJ's...and found myself following someone else into the furniture store next door. Now, I'd been avoiding regular furniture stores. The merchandise is usually scaled for a mini-mansion, not an apartment. And the sales guys drive me nuts: "Hi! Can I help you find something? What are you looking for? What style? Sure you don't need a sectional? I can give you a sweet deal on a whole living room suite...." I mean, I know they get paid on commission and they're just doing their jobs. I don't fault them for that. I would just rather tour their selection in peace. But it was almost as if I were being prodded to go into this store. So I did, against my better judgment. And just inside the door was a bonded-leather, swiveling tub chair, for half the price of the one on my Pinterest page. And it was comfy! Needless to say, I bought it. It'll be delivered Thursday. I'll post a picture next week. This moment of Universal blogginess has been brought to you, as a public service, by Lynne Cantwell.